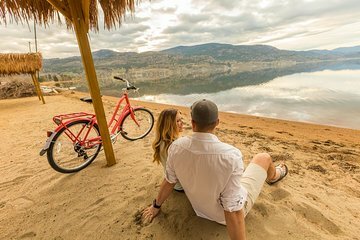 Penticton is a beautiful place that I highly recommend visiting. We will definitely be making an effort to revisit in future years. The Brewery and Bike tour was good. This was our 2nd activity with the Hoodoo adventure co and all the staff were very friendly. Our guide for the bike tour was extremely knowledgeable about the area and about the wines and beers distilled in the region. Only change I would make and not necessarily to the trip but to the advertising prior to booking is that the actual beer tasting is not free. whilst I appreciate the small print does state 'alcohol not inc', when it's advertised as craft distillery and brewery bike tour, it kind of suggests that you would have at least 1 beer included. Also anyone expecting a distillery tour similar to what they have in Irelands' Guiness tour, this is nothing like it. These distilleries are all micro breweries and the equipment is usually in one room that you can see during your tasting. Don't let these suggestions put you off as it's a beautiful region to explore and the best and safest way is on a guided tour. The bike ride was a gentle downhill trip with stops en route to take in the scenery. if you're looking for something more adventurous then i suggest you hire bikes and hit the trail yourselves, although I'm sure the co do guided tours for this as well. A definite if you like to gain info about the area and the history of the wine / beer making.